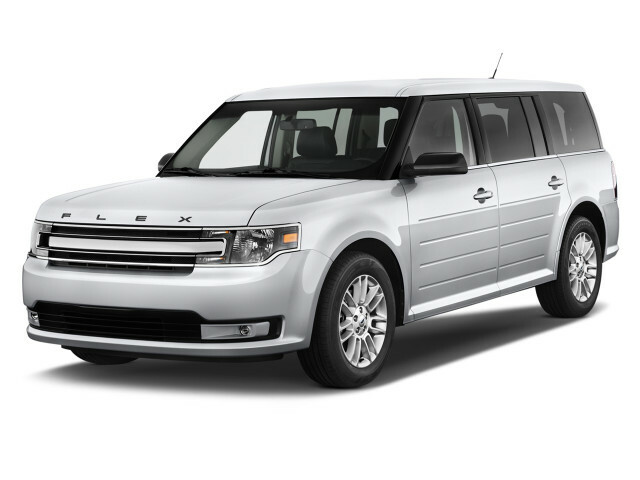 Shopping for a new Ford Flex? The 2019 Ford Flex’s twin-turbocharged engine is pricey, but lots of fun. The 2019 Ford Flex is what happens to leftovers from a five-star restaurant after a night or two in the fridge. There are still some great flavors, but they’re soiled by both age and proximity to newer, fresher food a shelf up. Ford’s Flex still drips with personality. 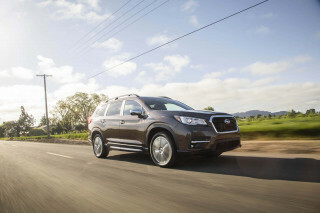 It’s still the antidote to boring three-row crossover SUVs that it was a decade ago, when it first arrived for the 2009 model year. Two new colors and wider availability of an integrated garage door opener mark the 2019 Flex in SE, SEL, and Limited trims. There’s some mid-century modern simplicity to the Flex’s angularity. It’s a wagon, albeit one that puts passengers up higher than most. Its flat roof and ribbed sides give the Flex more visual punch than you’ll find in most of its jellybean rivals. Inside, the cabin is light on charm but still has some of the nicest materials found in the Ford lineup. Front seat passengers have comfy thrones and even rows two and three don’t feel like penalty boxes. Some ergonomic quirks reveal the Flex’s dated architecture, but overall it’s shaped and mostly appointed like a Learjet on a budget. Underhood, a 287-horsepower V-6 comes standard, but we’d put our money on the 365-hp twin-turbo V-6—Flex crossovers are often discounted, so you might as well splurge. Front-wheel drive is standard and all-wheel drive is optional on the base engine and mandatory with the twin-turbo. The Flex handles with more verve than most crossovers, thanks in part to its comparatively low center of gravity. Decent crash test scores for the Flex are offset by its paltry active safety tech portfolio. Collision warnings cost extra, but no Flex has automatic emergency braking. Many rivals now fit that gear we consider essential as standard fare. The 2019 Ford Flex’s styling is bold, even if it’s been around for a while. The Flex—which maybe should have been called Edge—looks like it was designed with the leftover T-squares from Volvo’s design department when the Swedes discovered curves. Its two-box shape casts a strong shadow, and even the detailing doesn’t suffer. Side strakes stamped into the sheetmetal help it avoid slab-sided chunkiness. Up front, the USB port-like grille the Flex gained as part of a refresh a few years ago isn’t our favorite, but it’s certainly not dull. Inside, the Flex continues the clean, angular design to reasonable effect. Nice surface detailing gives it a classier feel than many more recent Ford designs and the 8.0-inch touchscreen for infotainment on most models is well-integrated. Base models look dour, though, with their tiny screens and plethora of dated matte silver trim. The 2019 Ford Flex rides well but requires spending big bucks for decent performance. 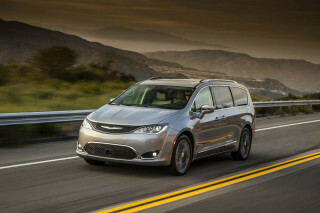 The 287-horsepower 3.5-liter V-6 that comes standard on the Flex is smooth and works well with its 6-speed automatic transmission dance partner, but it never overcomes the 4,500-pound curb weight. Front-wheel drive is standard and all-wheel drive is optional with the base engine. Our choice is the strong 365-hp twin-turbo V-6, which uses its 6-speed automatic to send power to all four corners. With this engine under its straight-edge hood, the 2019 Flex accelerates strongly and has plenty of power in reserve for highway passing. The Flex may be heavy, but it has a lower center of gravity than crossover SUVs such as its Ford Explorer platform-mate. Combined with its accurate steering, the Flex handles well and isn’t a stranger on a curvy road. 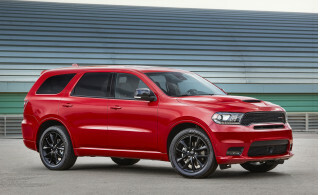 The Flex’s nearly 118-inch wheelbase—five inches longer than the Explorer—helps provide it with a comfortable, composed ride. The optional 20-inch wheels induce more cabin jiggle than the standard 17s, but that’s the price to pay for vanity. 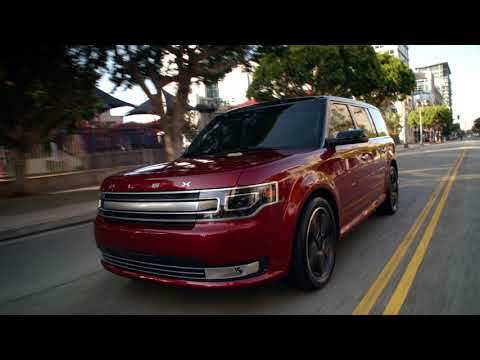 The spacious 2019 Ford Flex accommodates passengers and their cargo in comfort. If not for the limited 6-way power adjustment of the standard Flex driver’s seat, we’d give the lineup 8 out of 10 points. The front seats have good support and can be covered in either grippy cloth or surprisingly nice leather trim. Row two comes standard as a three-piece bench, while upper trim levels offer individual captain’s chairs. The second row folds forward to allow for about average access to the third row. We’ve put adults back there, but they start complaining about half an hour into the ride. Credit here goes to the Flex’s long wheelbase. At 118 inches from axle to axle, the Flex’s wheelbase is among the longest in its class. The Flex has about 20 cubic feet of cargo space behind the third row, enough for a stroller and a baby bag. With row three’s individual seats folded flat, that grows to about 43 cubes. Maximum capacity of 80 cubic feet means the Flex is ready for a trip to Home Depot. The Flex has ample soft-touch materials with interesting grain patterns inside, although even the Limited stops short of feeling luxurious. The 2019 Ford Flex is missing some key active safety tech. But the highest it could score would be a perfectly average 5 out of 10. 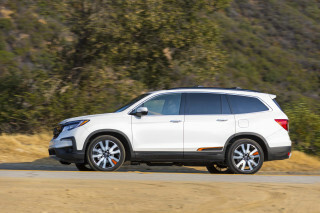 It’s not an IIHS Top Safety Pick on account of its lack of active safety tech and headlights that rate “Poor” and “Marginal” depending on the trim level. The Flex is also missing automatic emergency braking—it’s not even an option. Flex Limiteds can be ordered with a package that pairs adaptive cruise control with a power-folding third row and collision warnings for a hefty $2,900, but that’s it. One feature that stands out for the Flex is its available second-row seatbelt airbags, which Ford says hold passengers in place better than conventional airbags. The downside is that the seatbelt airbags result in large shoulder belts, which may make some smaller passengers uncomfortable. 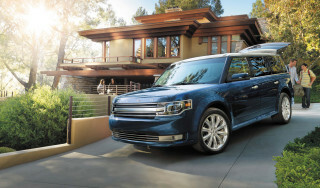 The 2019 Ford Flex can be well-outfitted with the right options selected—plus it’s usually discounted. The base Flex SE features 17-inch alloy wheels, power features, a power driver’s seat, parking sensors, and a 4.2-inch screen for its audio system. For about $31,500, that’s not exactly luxury fare. We’d step up to the Flex SEL. For about $34,300, it adds some niceties such as 18-inch wheels, heated front seats, and an 8.0-inch touchscreen for infotainment with Apple CarPlay and Android Auto compatibility. The Flex SEL also offers all-wheel drive for about $2,000. Leather seats, blind-spot monitors, upgraded speakers, and a power liftgate cost about $2,400. The range-topping Flex Limited costs almost $40,000 but adds 19-inch wheels, blind-spot monitors, and leather seats. It’s the only model that can be ordered with the twin-turbo V-6. Paired with all-wheel drive, the uprated engine adds a hefty $8,500 to the bottom line. All in, a loaded Flex Limited crests $50,000, but rebates and dealer discounts are common. The 2019 Ford Flex cuts through the wind like a heavy brick. 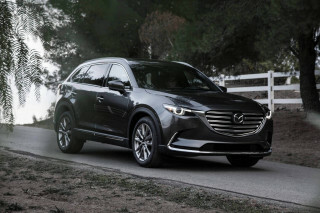 Flex crossovers with the non-turbo V-6 rate 16 mpg city, 22 highway, 18 combined with all-wheel drive and 16/23/19 mpg with front-wheel drive. The Flex Limited with the optional twin-turbo V-6 isn’t that much worse given how much more powerful it is, but that’s not exactly a compliment. The EPA rates it at just 15/21/17 mpg. That’s not far off of full-size, body-on-frame SUVs. At least the Flex uses regular unleaded fuel even with the twin-turbo engine.